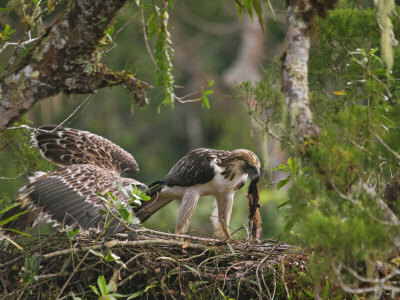 This article illustrates some of the noteworthy Philippine eagle facts. The Philippine Eagle belongs to the family of Pithecophaga jefferyiand is native to Philippine. They are arguably one of the largest birds on the world. It is also the National Bird of Philippine. 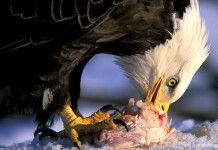 These eagles are believed to be the endangered species due to the habitat destruction and deforestation. 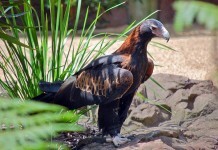 Monkey-eating eagle is the other name of this bird. Philippine Eagles have long been recognized as monkey-eating birds of prey as there were some evidences regarding Philippine eagle’s diet. However, as the research progressed, some other unknown facts came to the fore such as these eagles do not only rely on tree-dwelling animals rather they also prey on snakes, monitor lizards, civets, and colugo. These birds of prey are known to consume other birds including hornbills. The length of the Philippine is around 86 – 102 cm (2.82 – 3.35 feet). Philippine eagles weigh around 4.7 – 8 kg (10 – 18 lb). 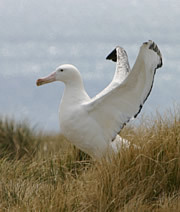 The plumage is brown and white, with undersides pure white and yellow legs. There is no significant difference between the chicks and adults. The average length of male is about 95 cm (3.12 feet), while the females are 105 cm (3.44 feet) long. One of the longest Philippine eagles measured 112 cm (3.67 feet) under captivity. Like other raptors, females are 10% greater than males. The average weight of these males is around 4.5 kg (9.9 lb), while the females are 6 kg (13 lb) by weight. The wingspan of Philippine eagles measure 184 – 202 cm (6.02 – 6.63 feet). These types of eagles are native to Philippine and are largely found in Mindanao, Luzon, Leyte, Samar, Mount Apo, Madre National Park, and Kitanglad National Park. Around 80 – 230 breeding pairs exist in these places. They are also found in montane forests and lowlands with a height of more than 1,800 m (5,900 feet). The Philippine eagles range is about 146,000 sq. km (56,000 sq. miles). Deforestation is one of the major causes of its extermination. 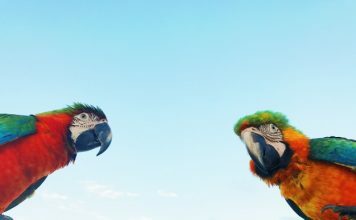 These are the aggressive birds. 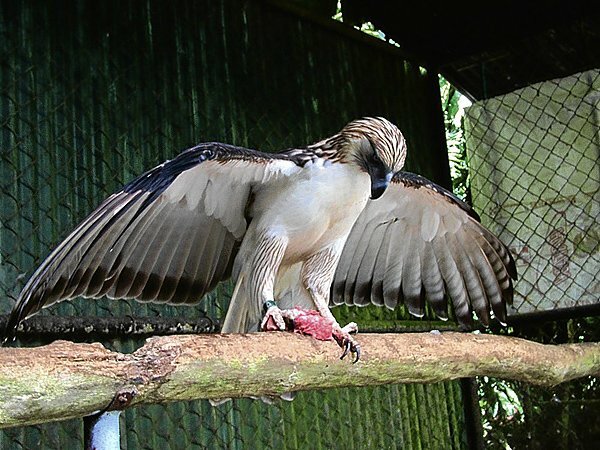 The lifespan of Philippine eagle ranges from 30 – 60 years. These species predominantly feed on monkeys, birds, Luzon, cloud-rats, flying foxes, monitor lizards, snakes, colugo, civets, owls, and hornbills. They are also known to hunt pigs and small dogs. While the males turn out to be mature after 5 years; females become mature after 7 years. They are the monogamous birds in that both males and females live together for the most part of their lives. The breeding season start in September and ends in February. The seasonal changes of weather affect the Philippine eagles breeding. 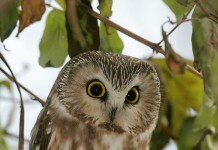 They build nests that are at least 30 metres (98 feet) above the ground. These nests are 1.5 m (4.9 feet) in diameter. Females usually live 8 – 10 days without food or drink before laying eggs. 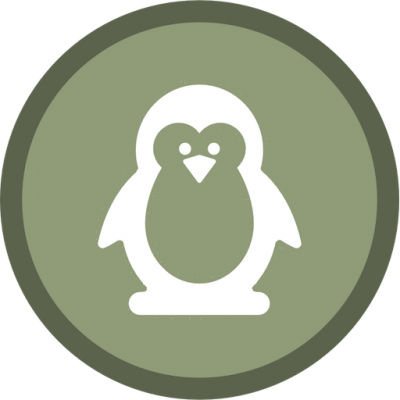 The incubation (keeping warm) process lasts for 58 – 68 days. Both parents incubate eggs. The chicks fledge out after 120 – 150 days.